When you want to bring some lighting to your outdoor property during the night a good option would be the solar floodlights. They are some of the brightest and most concentrated lights and typically are made with LEDs, rechargeable batteries, photoelectric switch and solar panels. 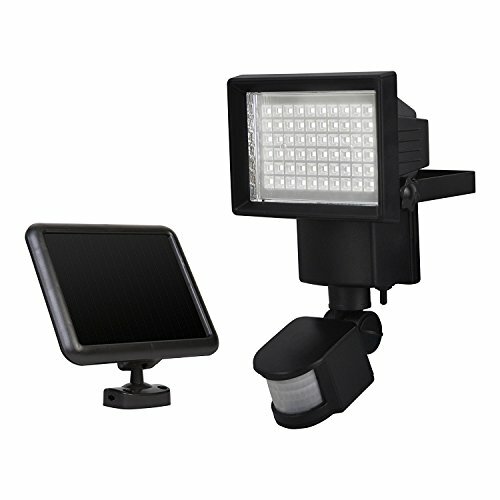 You may also use the solar floodlights as solar security lights as they come with motion-activated features. This doesn’t mean you can’t disable the motion sensor, when in need. Most solar floodlights comes with LED bulbs, as they are more reliable than Halogen bulbs. LEDs are more durable, offering more energy and more brightness at the same time. Furthermore, LEDs don’t burn out that easy either. It’s easy to install the solar floodlights and most of them come with all the tools you need: mounting brackets and hardware. It’s important to set the right position and bolt/screw the mounting brackets onto the chosen surface. If you’re not installing them into wood, but on a harder surface, you need some previous preparation. You do have to drill a hole and insert a masonry anchor into the hard surface. 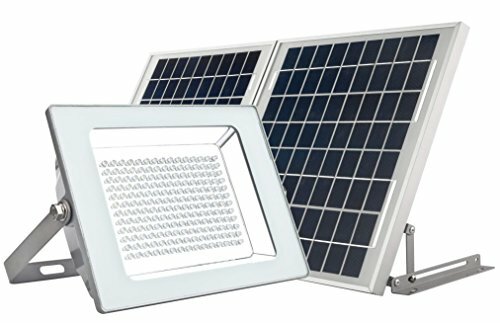 When looking for solar floodlights, especially the ones for outdoors, it’s important to check not only the illumination intensity, brightness, or the quality of the solar panels, but also the durability and weatherproofness of all parts, sensors included. 1). 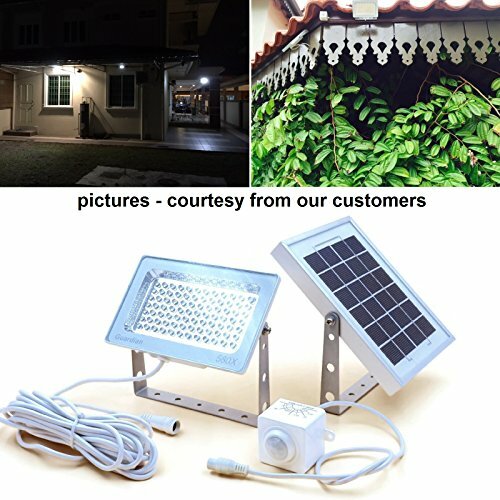 If you’re going shopping on a fix budget, you may still get a good deal with a solar flood light like the Solar Floodlight; 30 LED Outdoor Security Light. Easy to install and to use, the lights are quite dependable and manage to light up a small area, for the entire night. You may use the lights outdoors since they are waterproof. They automatically light on from dusk to dawn, providing the light you need at specific times. They also come with Li battery inside, which explains their durability. The solar panel don’t need much time to charge (one hour should be enough). We notice the versatility of the lights that may be used in various situations. They present multiple settings, so you can have the right setting for a specific condition. The cable is long and flexible, which gives you the chance for better installation. Great for a small area, the lights have a sturdy build and are a nice surprise when it comes to their performance. Despite the minor issues, the lights make it as a good, dependable solar flood option for a small area. 2). Bright and easy to adjust, the Sunforce 82080 80-LED Solar Motion Light are easy to mount, wherever you choose to do it. 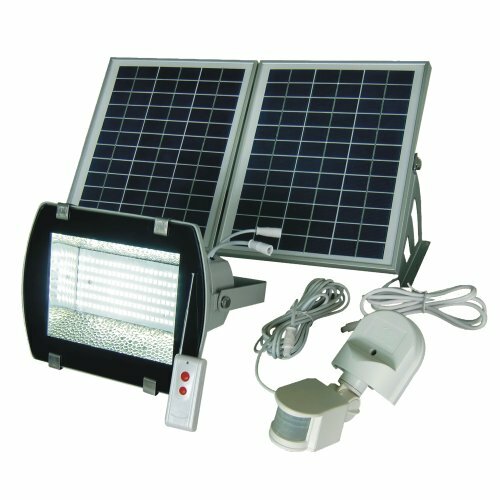 The solar lights come with 80LED solar motion light, the mounting hardware and rechargeable batteries. You can definitely mount the lights outdoors as they are weather resistant, providing the same bright lights, with a maximum lumen output of 900. They have a weatherproof design, which makes them a good choice for the outdoors. The amorphous solar panel is reliable and doesn’t need direct sunlight for charging. We really like the lights for the great detection distance (30feet) and detection range (180 degrees). You may confidently use them to secure your garage, pathway, home and so on. We also appreciate the adjustability of the lights as you may choose the time setting (30, 60 or 120 seconds) or distance (controlling the distance of the range of motion detection: low/medium/high). 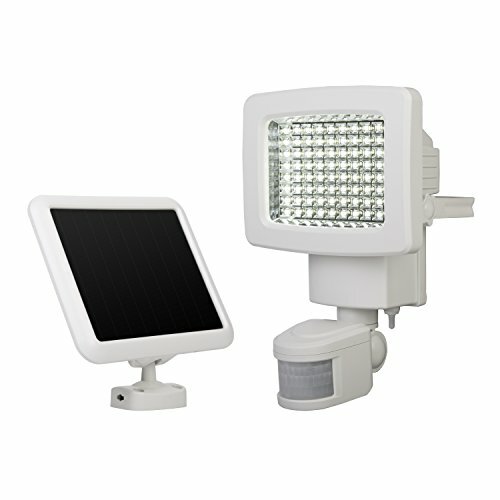 Easy to install and to use, the solar floodlights are efficient in so many situations. Nevertheless, for the bright light and adjustability, the solar lights work great as floodlights, wherever you’d install them. 3). 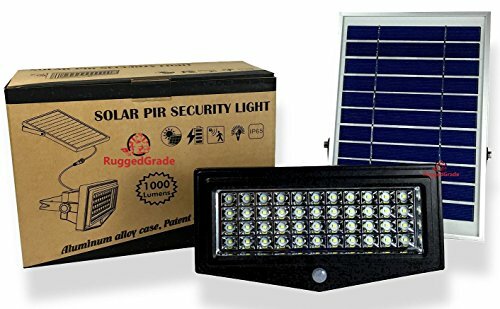 There are many things we like on the GUARDIAN 580X Solar Security Floodlight with Standalone PIR Motion Sensor, but the reliability and bright light may be the most important ones. The 6watt 84pcs LED of the lights give a maximum output of 730 lumen, whereas the typical operation (dim mode) is around 55 lumens. The lights comes with a standalone PIR motion sensor, which gives them versatility. The adjustability is great and you may choose one of the 3 lighting modes: normal floodlight, full brightness or lights off when there’s no motions. Lights only comes on at night and they don’t turn on during daytime. The detection range is pretty good (10-12meter), whereas the angle is also good (180 degrees). The lights come with a 2500mAh Li battery bank that is pretty durable and presents good thermal stability. The battery takes a good beating, providing high current rating and an impressive 1,000-cycle life. It’s easy to install the lights and the long cable lets you find the perfect place. The solar panel has a compact design and has an aluminum frame design. It’s IP65 graded, meaning it’s waterproof and safe to use outdoors. The cast iron housing is durable and expands the long lifespan of the lights. All fitting are made with stainless steel, for more strength and corrosion resistance. The lights charge well and the motion sensor is very sensitive. The housing is high quality and the lights are dependable. All in all, for the easy installation and reliability, the solar floodlights are a sure buy anytime. 4). Bright and great as security lights, the High Power 1000Lumen Solar Motion LED Flood Light are worth to buy whenever in need. 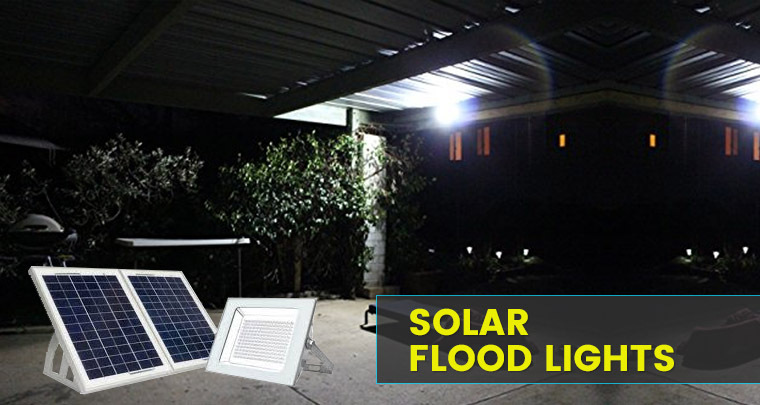 The lights give a maximum output of 1,000Lumen and the solar motion flood light keeps your home safe. They are strong enough to brighten up your driveway or backyard. You may install it to secure the area around your house or your business. The motion and light sensor built in means that the lights go from 10% power to maximum brightness when detect movement. The sensing distance is from 0 to 5 meters and the lights remain bright for 30 seconds. The lights presents three lighting modes: bright/dim/recharge and each of them is useful in a specific situation. It’s easy to install and to adjust the lights, with no need for the help of electrician whatsoever. You may easily mount them onto wall or other surface. In order to get the right angle, you need to install the solar panel and the LED separately. The cable is long and you may easily adjust the angle in order to get the best place for the light. The lights also come with an 8000mAh battery that has a long lifespan and it’s easy to replace. As for the build, we need to mention the high quality aluminum and tough plastic construction. The lights are IP65 graded, which means are outdoor waterproof and safe for the outdoor use. The lights may work all night and the solar panel charges fast, even on cloudy days. The light is constant and the lights are solidly made. Regardless, for the reliability and durability, the lights are a great choice when you want to secure your home or business. 5). The more you’re willing to pay for your solar floodlights, the more you should expect from it. It’s the case of the MicroSolar – Super Bright – Lithium Battery – 180 LED IP65 Solar Floodlight that bring many good things to the table. One thing that helps them stand out is the heavy-duty build as they come with aluminum fixture. They are also waterproof and the light is a nice, white, and bright. The lights include 180pcs of bright LED that provide a maximum of 1000Lumen output. They turn on and off automatically, lighting up from dusk to dawn. The solar panel presents an angle adjustability and comes with metal, sturdy brackets. It’s IP65 graded, taking a light rain. It charges fast, even on a cloudy day. The lights also come with a durable Li battery that takes the intense use. The cable is long so you may easily install the lights on ground or wall. The lights come with all screws and bolts you need for installation. The metal bracket is solid, yet flexible so you can install the lights in the designated place. They come with stakes for the solar panel and light, for more versatility. Apart from the bright light and solid build, we also need the mention the modern appearance of the lights. As long as you’re ready to spend the extra buck, the lights are a good investment, especially when you want to secure your backyard. Just because you go shopping with just a few pennies, it doesn’t mean you have to come back home empty handed. The Sunforce 82156 60-LED Solar Motion Light manages to be a fair option when you want to light up your courtyard, but don’t really have the extra buck for it. 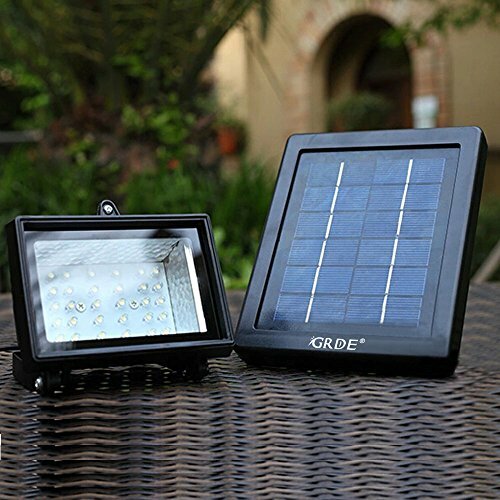 The lights come with amorphous solar panel and 60LED that present a maximum output of 850 lumens. They also come with one Li-Io rechargeable battery and the hardware you need for mounting. The solar panel is efficient and manages to charge even on a cloudy or snowy day. The detection distance is good (300 ft.), whereas the detection range is 180 degrees. This means the lights may secure your garden pretty nicely. They turn on automatically when detect movement and the 3 adjustable settings increase their reliability. The LUX (light level) identifies the level of darkness that makes the light turn on, whereas the SENS (sensitivity) spots the range of motion detection. Once the movement is detected, the TIME recognizes the duration of the light (30/60 or 120 seconds). The IR sensor is not only responsive, but also easy to adjust in many ways (up/down or left/right). The lights are easy to install and easy to adjust. They are made with quality materials and present a weatherproof design. All in all, for the good light, adjustability and good build, we’d say you don’t end up with a lemon when getting these low priced lights. 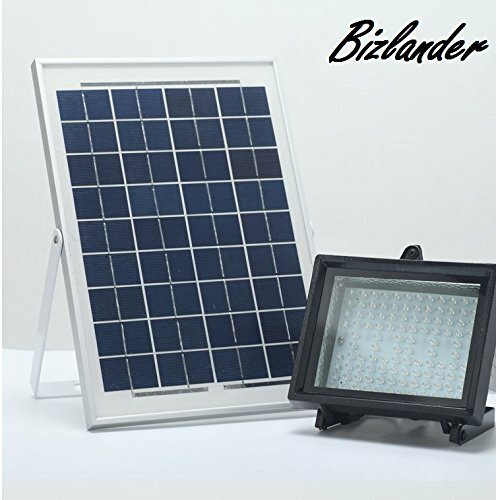 The fact that the light is detachable from the solar panel may be one of the best features of the BIZLANDER [2017 NEW] Commercial Grade Solar Flood Light 108 LED Security Light. The lights come with 108 LEDs that give 1109lumens output. They are commercial grade lights, working throughout the entire night. The list of good features includes an IP65 waterproofness grade, which means you can safely use the lights next to your pool. The lights come with a 16ft. long cord so you may mount them on wall, ground or a tree. A manual switch lets you override the automatic setting and the light is detachable from the solar panel. This increases its portability and versatility, for sure. The good build of the lights make them right for the outdoor use and the Li-Io rechargeable battery expands the lifespan. The lights are easy to install and need little to none maintenance. The light is bright and it may run for 10 hours after it’s been charged throughout the day. The solar panel is effective and charges even on a cloudy day. Durable and dependable, the lights do stand out with their versatility and portability. The cons are minor though and we only focus on the goods: bright, reliable and detachable lights that deliver all night long. Even though you may feel, you’re paying an arm and a leg for them; once you install the High Powered LED Solar Flood Light you come to realize they are sure worth it. The solar panel is strong and efficient, charging even on a not-so-sunny day. The lights come with 156 LEDs that are very bright and provide almost 800 lumens output. The lights aren’t just easy to install, but also easy to operate thanks to the on/off switch. As for the materials and build, we notice the solar panel is 20-Watt poly crystalline, whereas the dye cast aluminum lamp housing presents durable tempered glass. The wire is 9ft. long and has waterproof connection, for longer lifespan. The lights also come with a durable Li-Io battery and a sensitive motion sensor. You may set the lights as Dusk to Dawn flood light, or as Solar powered motion activated security flood light. The motion PIR detector is easy to adjust for that, you simply need to decide and switch to the desired operating mode. The lights are able to light an area of 30’ wide x50’ deep. You may safely use them to secure your driveway or a parking lot, if that’s your need. You may also use the on/off switch on light fixture to override photocell. The lights come with wall mount brackets and two solar panels. You may want to install the lights for ground effect, lighting up walls or structures. On top of everything, for the high performance and good build, the lights are a great option for so many outdoor needs.